← Stories and traditions in Cusco – ICPNA AV2 writing exercise. The end of supply-side economics? I was reading the news stories the other day about the Boeing machinists strike and the potential sale of Chrysler. Interestingly both those companies are headed by former GE executives. My friends at the GE plant where I used to work are actually affected by the Boeing strike, not a fun prospect with the holiday season coming up. Now working for GE was the best job I’ve ever had. The company still has a fixed pension plan, affordable health insurance, education benefits, etc. In the aircraft engines business we had world-class engineering, a very safe work place and generally a fantastic team of people. However, I was never a big fan of GE’s corporate culture and I believe the current meltdown in stock markets, credit markets and housing prices has much to do with corporate America’s culture and beliefs. Jack Welch’s infamous idea of double-digit earnings growth is no different from the belief many real estate investors held in recent years of double-digit price increases. Those kinds of beliefs totally ignore the fact that money is just a funny printed paper bill, it has value only in how it facilitates the exchange of goods and services. In my opinion the current crises show that globalization, outsourcing and supply-side economics in general have their limits. The banks and hedge funds who were leveraging their funds 30 times or so were in effect playing Federal Reserve, printing up their own money. Problem is, if you don’t offer some valuable goods or services, the money remains just a funny printed paper bill. In terms of housing prices, the damage has already been done. Either prices have to return to historical levels or we have to experience steep wage inflation to bring the cost of owning a home back in line with personal incomes. We may be able to apply some bandaids such as 40 year mortgages, but at the end of the day we have to bite the bullet on this one. As for Chrysler, Boeing or any other company trying to prepare for what will undoubtedly be a significant global slowdown the answers are easier. People’s quality of life isn’t determined by how much stuff they have. I make less in one week here in Peru than I used to make in a day at GE, but I’m just as happy if not happier. Hopefully CEOs like Bob Nardelli and Jim McNerney can wrap their minds around the idea that people’s quality of life is more important than earnings growth. You only have to look as far as companies like Honda or Southwest Airlines to realize that a company that offers good products/services and has a motivated workforce will do well in the long run. 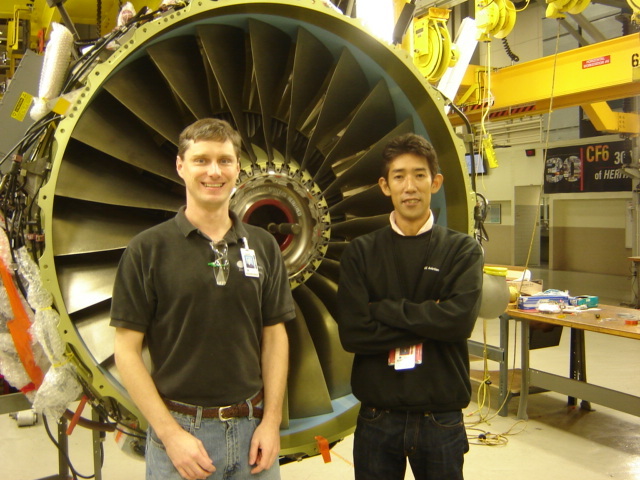 My friend 'Bridge' and I at the GE jet engine shop in Durham, NC. This entry was tagged Boeing, business, Chrysler, corporate culture, GE, international business. Bookmark the permalink. Ward — Some really good thoughts on the relevance of “things” in terms of happiness. I’ve already noticed a movement by people to start saving and it becoming the in thing to try and cut back, whether you need to or not. This first appeared with the environmental movement, but now seems to be gaining momentum both out of necessity and because I think people are starting to realize the over-consumption has gotten us almost nowhere. I’ve noticed relief by some people too. They no longer need to “keep up with the Jone’s” (or at least not as much); which I think what was spurred on a lot of our consumption in the first place. I like the blog and I’ll favorite it and come back to read more. Keep it up! Great thoughts, ZMonet: I agree that the environmental movement should have an impact on reducing consumption. I don’t think technology alone can help protect the environment, at some point we need to decide how much “stuff” we really need to live happily. Sound ideas, Ward, re corporate culture’s mistaken idea that chasing huge profits is everything in business. As you say, companies like Honda, which keep their eye on the long-term, treat their workers more fairly and are able to sustain growth.